Offices and business can benefit from the advantages brought about by Epson Impact Printers. This is one of the leading and more popular brands, known for their printing equipment and impact printers are one of those that they excel in. Epson Impact Printers deliver high performance with their fast speeds and versatility, being capable of printing in different media forms and sizes. They utilize low cost of consumables and have long power on hours (POH), making it cost efficient and favorable to any type of business. LX-300+ II is an impact printer that meets the vital requirements of businesses with its speed, reliability and user friendly attributes. It is compact with its size of 14.42" W x 10.84" D x 6.26" H and weight of 9.7 lbs. This makes it suitable for limited working space. It has a high draft print speed of 300 characters per second and a draft speed of 225 characters per second. It produces near letter quality as fast as 56 characters per second. This printer can handle a variety of tasks such as invoices, receipts, spreadsheets, inventory reports, packing slips, check runs and customer shipping labels. This is made possible with its narrow format and durable 9-pin technology. 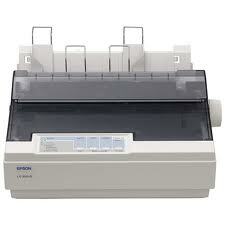 It has good paper handling features , being able to print in different forms of media like no.6 and no. 10 envelopes; labels with widths of 4“ to 10” and lengths of “ to 22”; and roll paper with width of 8.5”. For greater versatility, the LX-300+ II features multi-paper paths: push and pull tractor, top in, top outmanual insertion; top in, top outcut sheet feeder; rear in, top out push tractor; and front or rear in, top out pull tractor. It delivers high performance with its long life of 6000 power on hours. The printhead has a life of 400 million strokes/wire for mono and 100 million strokes/wire for color. It is quieter than most printers with its sound level of 49 db. Epson FX-890 is a 9-pin narrow, robust, impact printer that offers a lot of features to meet the everyday printing needs of an office or business. It measures 6.3" W x 13.8" D x 6.6" H and weighs 16.8 lbs. It incorporates the Epson Remote Configuration Manager™ software that makes it easy to set-up and use with the help of Windows operating system. It has Parallel and USB connectivity. It can handle different forms of media such as: single sheets of widths 3.9" to 10.1" and lengths 3.9" to 14.3"; continuous forms of widths 4" to 10" and lengths 4" to 22"; and cut sheet feeder of widths 7.2" to 8.5" and lengths 10.1" to 14". It can, likewise, handle no. 6 and no.10 envelopes; roll paper with 8.5" width and labels with a minimum size of 2.5" x 0.94". It has multi paper paths of : front or rear in, top out manual insertion; top in, top out cut sheet feeder; front, rear or bottom in, top out tractor; and front or rear in, top out push pull tractor. Epson FX-890 has an ultra draft print speed of 680 characters per second, a high draft print speed of 559 characters per second and a draft print speed of 419 characters per second. It produces a near letter quality at 104 characters per second. It has a long life of 20,000 power on hours and its printhead has a life of 400 million characters at 14 dot/character. It is able to handle a wide variety of media forms and sizes: envelopes of sizes 6 and 10; single sheets with widths of 3.9" to 16.5" and lengths of 3.9" to 14.3"; continuous forms with widths of 4" to 16" and lengths of 4" to 22” ; and cut-sheet feeder with widths of 7.2" to 16.5 and lengths of 10.1" to 14". It makes use of the same multi paths as FX-890. Epson LX-300+ II, FX-890 and FX-2190 are the devices featured in Epson Impact Printers. They provide solutions to the daily requirements of an office or business with their high speeds and versatility of printing in different forms and sizes of media. They, also, make use of convenient multi paper paths. These impact printers have long power on hours (POW) on top of the printhead’s own long life, making it translate to cost savings in the long run.